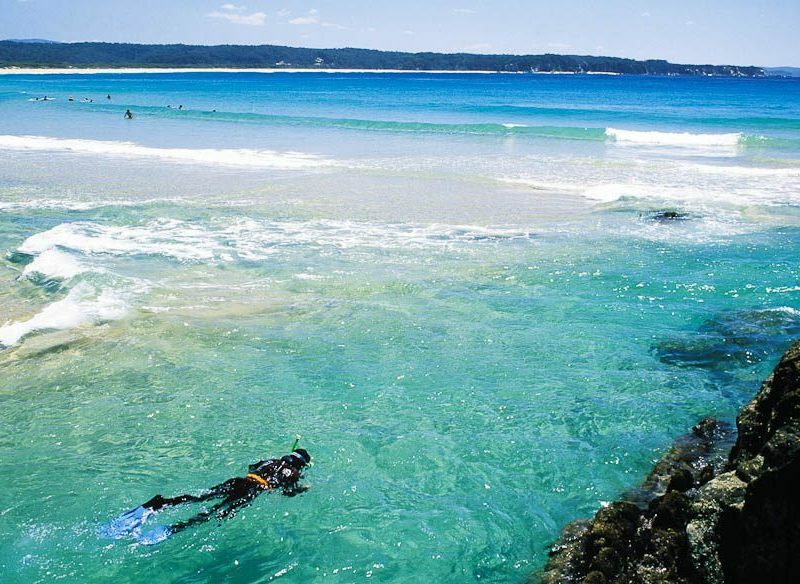 Snorkeling the azure far south coast gem Tathra. The NSW South Coast is brimming with secret pockets of adventure and relaxation. Here are a bucket list load of tips to make you feel like a South Coaster this summer holidays. 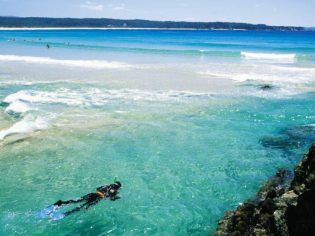 Tathra (1), about 20km east of Bega, is sandwiched between two national parks – Bournda to the south and Mimosa Rocks to the north – a 17-kilometre strip of rugged coastland popular with surfers, fisherman, snorkellers, bird watchers and walkers. All you need for a Tathra holiday is your swimmers, thongs and beach cricket gear. The Princess Highway bypasses timeless Tilba Tilba (2)– and this is a very good thing indeed. The halt of progression in this unique town offers a chance to time travel to a perfectly preserved heritage village. Nearby Mt Dromedary (Gulaga), with its rolling hills and at times eerily descending mist, is crisp and refreshing with a century old cottage nestled between woodlands and flowerbeds. Cheese-making has given Gerringong’s 19th century The Old Schoolhouse (3)a new flavour. Cheese is now made on site, using local milk from pasture-fed cows and the tea served is also grown locally. Open Thursday, Friday & Saturday from 10am-4pm. The retro Bodalla Dairy Shed (4) café and milk bar has breathed life into the village over the past few years. A boutique cheese, yogurt and milk factory has opened on site and the kids can ‘learn where the milk comes from’ via the farm animal experience. The ABC Cheese Factory (5) in Central Tilba, built in the 1890s, now makes its own brie, camembert, swiss, feta and cheddar using milk from its dairy. Berry’s Sourdough Café (6) is certainly worth turning off the highway for. Within the heritage-listed rustic building the food is consistently good, but the woodfired local field mushrooms, Robertson blue and walnuts on sourdough should be number one on your list. Kiama’s Milk and Honey Café (7) has scored a tasteful refurb, making the most of the coastal light, and the local-facing menu has also been refreshed. Mollymook local Noel Butler, an Aboriginal elder, runs The Digging Stick Art and Food (8), a new café serving nosh with an indigenous twist. Contemporary aboriginal art is also for sale. The Euro-style restaurant The River Moruya (9), which scored a hat in SMH Good Food Guide 2014, uses locally sourced (and mostly organic) produce, with everything made in-house including its scrummy cured meats. Further down the coast in Moruya, the Rustic Oven Pizzeria (10) has recently opened its doors, serving heart Italian fare. Tyler’s Kitchen (11) in Malua Bay, 15 minutes south of Batemans Bay, is a fresh option for off-the-boat catch of the day. Patriotically, it also uses native plants and herbs in its cuisine. Silos Estate Winery (12), in between Berry and Nowra, shows its guests around the 40-acre property (complete with grazing alpacas) by whisper-quiet Segway tours. Cupitts Winery (13), near Ulladulla, also offers tours on the apparently easy-to-manoeuvre machines. Tilba Valley Wines (14), on the shores of Lake Corunna, is great place for a game of bocce or croquet. Stay to sample wines, Australian port and muscat and a ploughman’s lunch or Devonshire tea. Bikers family? Check out Australian Cycling Holidays (15), which has a selection of self-guided, multi-day tours that drink in the scenery. Feeling energetic? What about the newly launched (Jervis) Bay and Back 2 ½ day tour. Phew! Not that the kids need an excuse to return to good ol’ Jamberoo Action Park (16), but there were two new water attractions installed last summer: The ‘Funnel Web’ and Banjo’s Billabong – the “largest interactive water play area built in the Southern Hemisphere”. Jervis Bay’s Dolphin Watch Cruises (17) has recently added the open-topped Eco Explorer to its fleet to get up close to the bay’s sealife, sea cliffs and the brilliant white sands. And, of course, the South Coast is spoilt for choice as far as water-based action (and inaction) goes, be it at Montague Island (18), around the spectacular white sandy beaches around Jervis Bay (19) or at one of the many sleepy beach breaks (20) dotted along the coast. For more information, see Visit NSW.